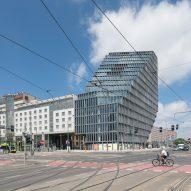 MVRDV has built a tower block in Poznań, Poland, that looks like a huge staircase from one angle, while from another it looks like it's about to topple over. 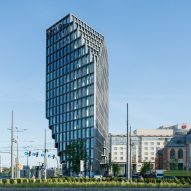 The 16-storey Bałtyk tower is the first building in Poland by Rotterdam-based MVRDV, and was completed in partnership with local firm Natkaniec Olechnicki Architekci. The tower features a dramatically staggered form. The aim was for it to appear to change shape, depending on the viewing angle. From one side, the building's offset floors resemble a broad staircase climbing up towards the sky. But from the other side, a tiered cutaway in the base of the structure makes the building look precariously unbalanced. 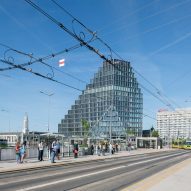 Described by MVRDV as "one of Poznań's most talked about new buildings", Bałtyk is a 25,000-square-metre mixed-use building containing offices, shops, a restaurant and other amenities. The staggered floorplates not only made it possible to create generous terraces for many of the office floors, but also allowed the building to keep its distance from the busy Rondo Kaponiera road intersection. 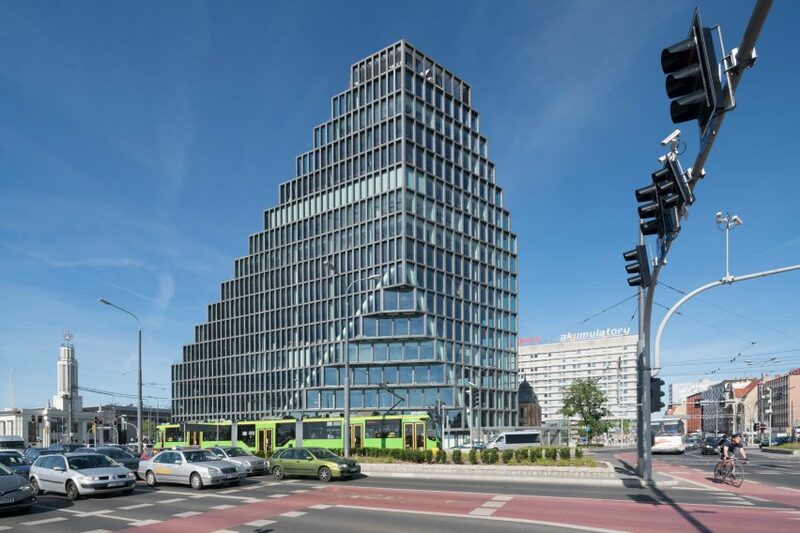 "When we came to Poznań for the first time, the goal was clear, we were to realise a representative office building with public functions on the first two layers and at the top," explained MVRDV co-founder Nathalie de Vries. "We realised that if we could control the footprint of the building, we were able to create a new square between Baltic and Concordia," she continued. "We responded by turning diagonal shapes into terraces, usable by the office workers." 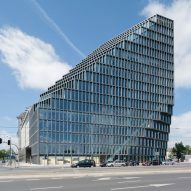 MVRDV used a similar approach on projects like the Pushed Slab office block in Paris and the DNB Bank Headquarters in Oslo. But Bałtyk shows how the idea can be applied to a high-rise structure. De Vries describes the result as "a thin building that is very different from all four sides". "It is slim towards the top to create a more tower-like feeling but still respective of the neighbourhood height restrictions," she said. 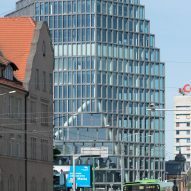 The tower's external skin takes its cues from other buildings in the area, particularly the modernist Okrąglak, or rotunda, completed by architect Marek Leykam in 1954. Both Okrąglak and Bałtyk feature walls of small gridded windows, divided up by slender frames. But instead of the traditional concrete of Leykam's, MVRDV worked with a dark concrete that is speckled with glass fibres, creating an unusual finish. These protruding frames also function as louvres, reducing the impact of the sun on the office spaces within. There are 12,000 square metres of office space in the building in total. The restaurant – which also features a single-room hotel – takes up 750 square metres, while 1,350 square metres is given over to retail. There are also three levels of underground parking. MVRDV was one of the highest ranking architecture studios on Dezeen Hot List 2016, coming in ninth overall. The studio, led by De Vries with Winy Maas and Jacob van Rijs, is best known for buildings including the Markthal Rotterdam market and the pyramid-shaped Book Mountain library. The completion of Bałtyk follows the unveiling of two other big projects for the studio – a park on a converted highway in Seoul and the revamp of popular Rotterdam design store Groos.